Uncertainty about the cloud holding you back? Worried about hidden cloud costs? Migrating to the cloud can seem like a daunting task. That is where we come in. technology to simplify the journey, thereby minimizing risks, and saving you time and money. applications and workloads with zero application downtime and absolutely no business disruptions. Our assessment services for cloud migration provide the crucial guidance you need before the start of your journey. 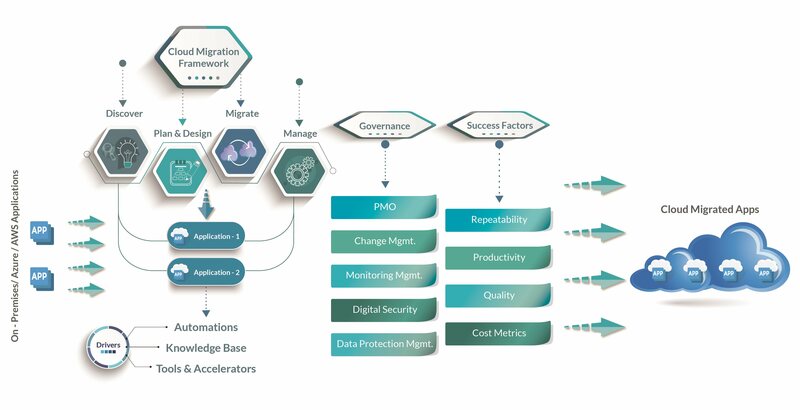 We help you set your migration priorities based on the business objectives that you would like to achieve. Using the discovery, mapping, evaluation stages, we help create a cloud migration plan. Our datacenter migration services set the pace for a quick, secure and smooth journey to the cloud. The expertise gained from hundreds of successful datacenter migrations translates into an organized approach using industry best practices, tools and technology. Using the “lift-and-shift” approach you gain a simplified and swift migration process that saves you time and money. The migration of your existing infrastructure to the cloud requires an alignment of your cloud infrastructure with business needs, while reducing complexities and risks. Your infrastructure needs, including compute, storage, operations, device and network, are reliably and securely migrated by our cloud technology experts using automation tools and processes. We assist you with the migration of your workloads from any source, without having to worry about the risk of downtime or costs, and help you swiftly realize the value from cloud. Our workload migration services utilize efficient tools and automation to simplify the process. You can reduce server downtime while enabling a secure transfer of workloads, either in groups or one at a time. Our single-pane-of-glass dashboard allows you to closely monitor your cloud journey. You can choose to either refactor or rearchitect your existing applications before migrating to the cloud. If you need to use the existing code then refactoring is ideal as your application can be easily repackaged to work in the cloud with minimal changes to the application code. Alternately, if need a revision to incorporate new capabilities and optimize the application architecture for cloud then rearchitecting is the right choice. Contact us to learn how NetEnrich Cloud Migration Services can provide true value for your business.